The Jesuit religious order released a list Tuesday of 50 priests who it believes credibly abused children, but some of the abusive priests are still wearing a collar and acting as priests. BUFFALO, N.Y. (WKBW) — The Jesuit religious order released a list Tuesday of 50 priests who it said credibly abused children -- including eight men assigned to schools or churches in Buffalo. But 7 Eyewitness News has discovered some of the abusive priests are still wearing a collar and acting as priests, raising questions about whether the Catholic Church continues to withhold information from the public. The Rev. J. Peter Conroy worked at Canisius College until 2002, when two women -- Colleen O’Hara Carney and Molly O’Hara Ewing -- came forward to say Fr. Conroy inappropriately touched and groped them when they were in seventh grade in the 1970s. The Jesuits said Conroy admitted to the abuse in 2002 and they removed him from Canisius and “impeded” him from ministry that year. The Jesuits’ Northeast province listed no assignments for Conroy after 2002 in the documents it released Tuesday, but the church’s own records show Conroy is still very much a priest -- and he’s not the only one. Other Buffalo Jesuits who abused minors were never “defrocked” or stripped of their status as Roman Catholic priests. Instead, some were quietly sent to retreat centers and other destinations where they serve to this day -- even after they have been placed on the Jesuits’ abuse list. “Even today, they cannot tell the truth,” Patrick Wall said of religious orders like the Jesuits. Wall knows much about religious order priests because he used to be one of them. The former Benedictine priest now works for one of the nation’s top clergy sexual abuse law firms, where he investigates the placement of religious order priests. He wasn’t surprised to hear that Fr. Conroy, after 2002, was not removed from the priesthood but rather reassigned to the Jogues Retreat Center in Cornwall, N.Y., outside Poughkeepsie. “There are no signs, there’s no disclaimers, there’s no written or verbal warning that if a parent wanted to go on a retreat, and their kids came to visit, that there would be absolutely no warning that Peter Conroy is there and about his past history,” Wall said. Conroy did not respond to a message seeking comment for this story. Jesuit documents released with the abuse list show the “safety plans” mean restricted Jesuits “may be asked to participate” in psychological treatment. In some cases, the records show, they are restricted from “public celebration of the sacraments” and they are not allowed to dress as a priest or use the title “Father” or “Reverend”. But in other cases, the documents say they “would be permitted” to preside at community eucharist, to lead community prayer or to hear confessions of Jesuits. William Scanlon, S.J., is another jesuit who used to work at Canisius College. The jesuits say he admitted to abusing minors in 1994 (not at Canisius) and they “restricted” and then “impeded” him twice since then. But that didn’t stop the order from including him in its official magazine in 2010, where he was shown giving Holy Communion. He is not listed in the 2018 edition of the Official Catholic Directory and his current whereabouts are unknown. The Jesuits say another priest who served in Buffalo, Rev. Denny Thomas, S.J., was credibly accused of abusing minors and was “impeded” in 2002. But as recently in 2016, he donated to a charity using his religious title. He is not listed in the 2018 edition of the Official Catholic Directory and his current whereabouts are unknown. Roman Catholic dioceses or religious orders can ask the Vatican that a priest be "laicized" or dismissed from the clerical state, a process commonly referred to as "defrocking." In some cases in the Buffalo Diocese and in one case of the Northeast Jesuits, Rome approved the laicization. 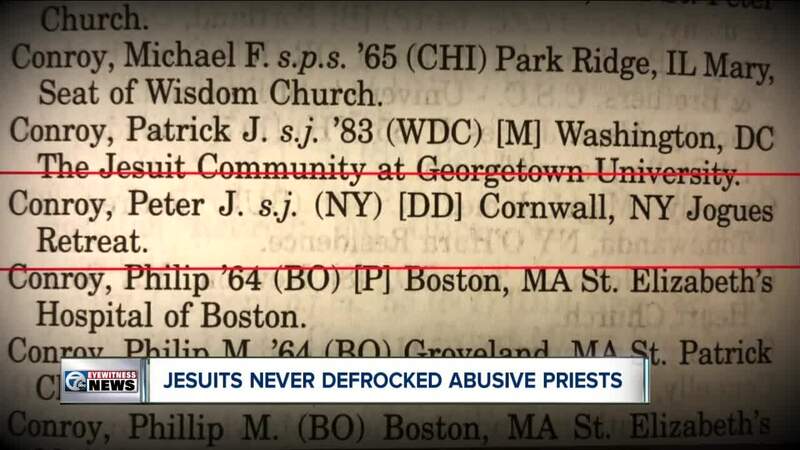 But for those who are not defrocked, the Jesuits do not list the priests’ current locations “for obvious reasons of privacy,” spokesman Mike Gabriele said in a phone interview. He said most of the accused Jesuits can no longer be prosecuted for their crimes because the statutes of limitation have expired. After decades of concealing abusive behavior, the Jesuits and the church are not worthy of that trust, Wall said. “As far as I know, I have never seen a Jesuit who is a properly trained probations officer who can truly supervise these guys,” he said.